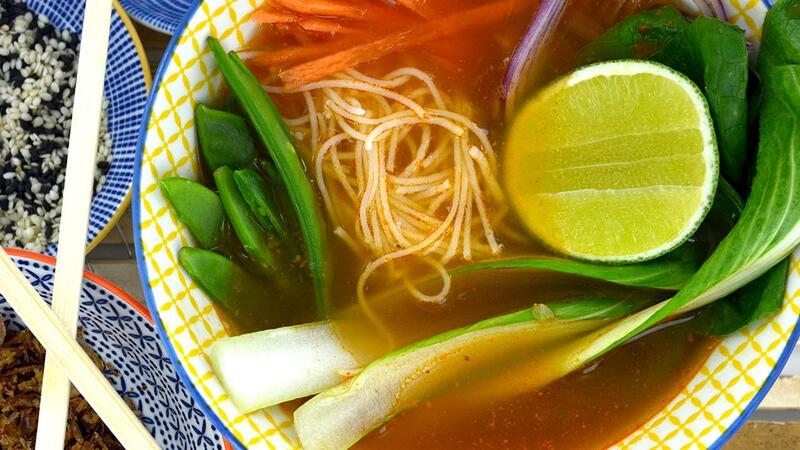 This flavour packed broth is a classic in the Asian cuisine. The soup recipe that originates from Vietnam will indulge all of your customers who want a slightly different Asian taste. In a large saucepan bring the water to the boil and whisk in the KNORR Professional Vegetable Jelly Bouillon and KNORR Blue Dragon Thai Red Paste then simmer for 10 min. Remove from the heat and allow to infuse for 30 min. Cook the noodles following the packet instructions then refresh in cold water then divide between the serving bowls. Finely slice the red onion, carrots and pak choi. Finely slice the chilli and reserve for garnish. Add the red onion, carrots and pak choi to the broth. Simmer for 2 min. then add the mange tout and mint. Pour the broth over the noodles and add the sliced chilli. Garnish with half a lime so people can season the broth to taste.